During the lunch rush hour, as I crossed the street heading back to my office, I ran into Deon. 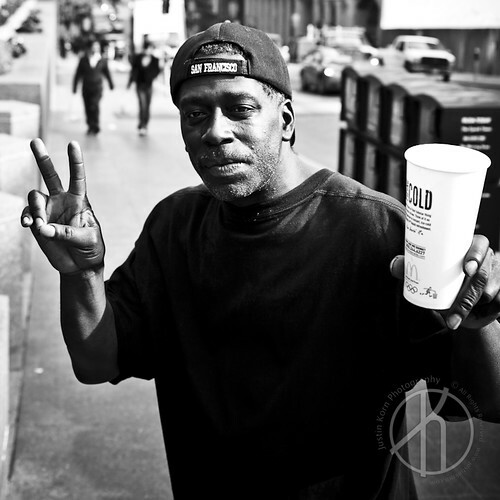 I told him about my BW$P project and he responded, “What, you want to draw my picture or something?” I explained I would take a photograph of him and apologized and he agreed. As we stood in-front of the Bank of America building and I prepared my camera, Deon made a comment, pointing to the BofA building, “I should work in here, you know?” I agreed and asked him how long he had been in San Francisco. He told me, “a long time…4 years. I’ve just been fucked up, you know. I got to cut it out.” I asked him how he has been fucked up and he told me he’s been high, doing crack. When I told Deon my camera was ready, he asked me how I wanted him to pose. I just told him, “do what you want, smile, make a face, whatever you feel like.” After a few pictures, I encouraged Deon to get clean and that 2010 could be his year. He was jazzed, “Thanks, I think you’re right.” I told him to have a great year and I’ll see him around and went on my way.